Selecting a couple more images from the November Still Life shoot. Who knows what I will go and round up when I have a camera in my hand. Most of my short experience with peonies has been with the lighter colored ones which I actually find easier to work with post processing because of differences in my monitors and the stronger colors. The objects were set in my general fashion with black felt as a background and ambient light from the window on the semi reflective surface of the old sewing cabinet I have been using. I probably should just do a series of posts simply of favorite things as I keep gravitating towards these old pieces I have. This particular vase was my maternal grandmother’s and very likely belonged to Great Granny too. It looks it. It is one of those things that doesn’t quite fit with modern tastes but has a charm of its own and I find that donut hole structure of it feels very right in hand. Easy to hold. Quite often with vintage items I will go online and see if anyone has one like it. I have found so many times when I think I have an object so unique and old that it must be one of a kind, I find something exactly the same for sale on eBay. A reality check of sorts. But, I haven’t found one like this yet in looking around. Maybe someone else out there has one saved from their grandmother too. I hope that you enjoy seeing the vase and the arrangement of the items. When working by a window the ambient light changes when time moves on and when clouds drift by, giving dimmer or brighter images. I rather liked the single peony below in the vase, it just looks so soft. PS: I am not a hoarder, possibly a pack rat, I just have always felt connected to people I have loved through objects they owned and used. ~ by Judy on January 14, 2018. Ah so! 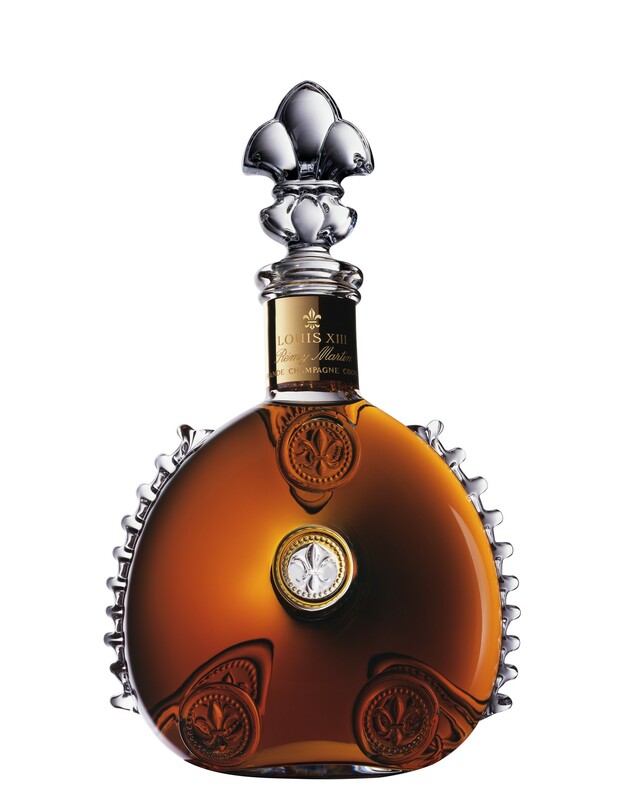 I found this Louis XIII Cognac Bottle and you are so right even to the little frilly things on the sides. Wonder if it tastes as good as it looks. What a beautiful bottle!! By any chance, is there a mark on the bottom? I’d say your vase is American, c.1920-1930. It’s very similar to other vase shapes (and lamp bases) of that era. The decal is similar to a popular one known as “Esperanza” that was used during that time. A lot of people don’t realize that there were companies which manufactured those decals, and you can date a piece by the decal as well as by the shape and material. In any event, china-collector me loves it, and the arrangement you’ve created is great. My favorite is the single flower in the vase, but all of them are nice. The pink flowers on the vase and the actual flower complement each other nicely! The donut shaped vase is has the gold shield of Bethwood Royal China Hand Decorated. The gold trim definitely looks hand painted while the floral parts must be decal…though very well done. From what I can see a high quality but not terribly prolific maker. I have a china collection now, but I haven’t collected since I started my blog and bought a camera. I actually spent a few years buying and selling online. Years ago, when the internet was just getting started, eBay was like the wild west, and there were great profits to be made. Collectors suddenly were free of the need to trawl through garage sales, and online sales became the thing. My thing was American pottery, c.1850-1920 or so. What I have left is mostly art china, chamber sets, and so on. I got out my DeBolt’s book on American pottery marks, and can’t find the Bethwood listed. My suspicion is that “Bethwood” is the name of a line belonging to a company like Sebring or Cambridge. There are several pieces for sale, and their marks match what you have, but I can’t find a bit of history. I sent off an email to a friend who specializes in 1930s-1940s art pottery, to see if she knows what’s up. I looked several times at the top and bottom photos, trying to decide which I like the best, and why. The bottom one won, but I’m still not sure why. Something of balance, the empty space having more weight than when a small object fills it. Maybe. I know what you mean. It can be a little undefinable sometimes. At first I liked the first one best but the more I looked the more I preferred the bottom image. I like the simplicity of the second image because I like the soft look of the flower. I thought the peony mirrored the flowers on the vase somewhat too, even though they may be roses. I do like that vase. Unusual. And I can imagine it isn’t so easy to find flowers that suit it.